Every year, after Peter’s birthday we slooooowly and reluctantly start up working again, on/ for Bearpaw Jewellery, our business. Actually, with both of us in our 60ties now, we could afford to – just stop. But how does one “put to sleep” a successful and thriving business? We can not sell it, because its value ins not in the large workshop with all our tools and materials, it is our ideas, our designs and our creativity, that makes up the value. Just stop everything, stuff it into boxes and bury it in the basement? We can not really bury our creative drive either. So for now, we decided, Bearpaw will transform from our “must do” to become more of our hobby and passion. For me, my shamanic artwork is also a responsibility. A promise I made. One, that I HAVE to keep, to the best of my ability. See, there are all the hundreds of furs – all recycled form discarded coats, to be sure, but still…. Many of these Animals were bred and raised in deplorable conditions, just to be killed for their fur. 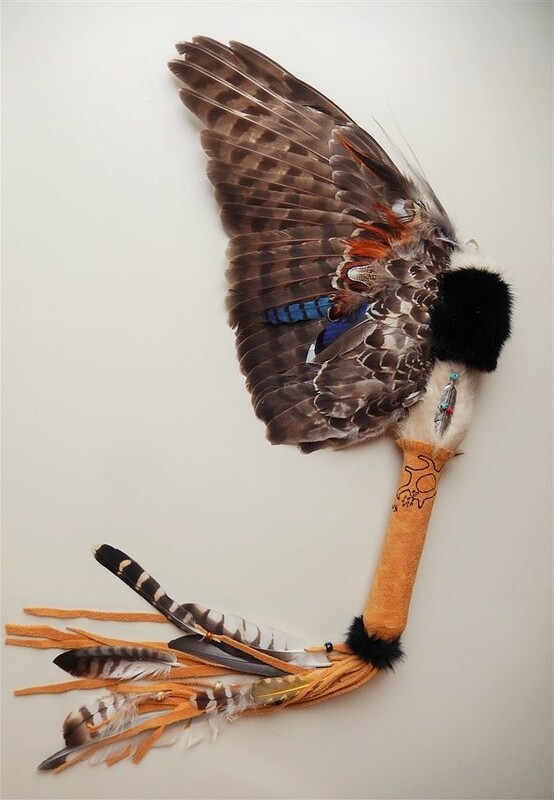 Then, quickly and with the rapidly changing social consciousness, it became “inappropriate” to wear fur and so the beautiful pelts ended either in the trash bin – or the 2nd hand shop – or people brought them to me, traded them in, for a piece of jewellery, knowing, that I would make meaningful artwork from the pelts. I promised to do that. Not so much to the people bringing the fur, but to the Animal Spirits still alive within……. For a shaman EVERYTHING is ALIVE! ALWAYS! Now however, I have about 10 large bins full of fur. Toooo much to ever be able to use it and work it all. So, I will share with the Native crafters living in the area……. Now these are cured and ready to work with. But before it is their turn, I have to work on the 2 Wings that came before them. This one is yet another Sharp Shinned Hawk. I mounted it onto a piece of Cactus root. Now the 2nd Northern Harrier wing is ready to take flight. – get “adopted”. It is a truly LARGE piece with a Quartz Crystal and a Heron feather at the top and a silver feather on the sturdy handle. The handle is also a functional rattle, being filled with Turquoise pebbles. 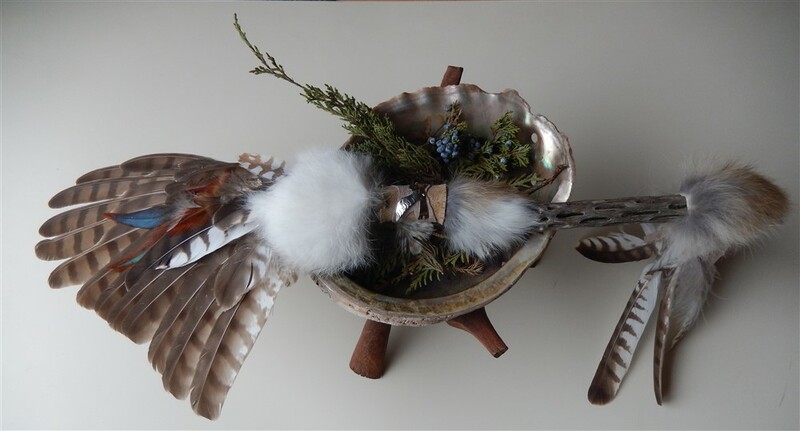 This Female Northern Harrier Wing Fan is my Medicine Piece in honour of Full Moon In January. 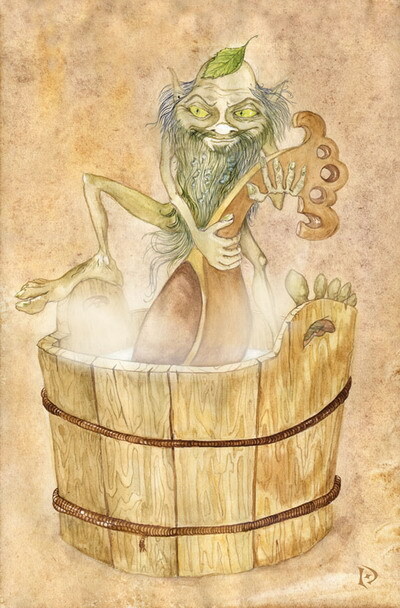 Today is January 6. an important date for many Siberian households, as tonight all the Domovois and Baniks = the house and bath Spirits are celebrating! They are dancing around the X-mas Tree, or Xmas decorations, that then can be taken down either tomorrow or the next following New Moon, if that is close. one puts out treats = sweets and fat, that they like = puts it under or next to the decorations. They take all of it, especially, if they felt neglected throughout the year – or just the Spiritual essence, iffff they were looked after…. Whatever is left, will be put into the fire or outside for the Birds the next morning. Also all the Animals, the pets and the ones in stables and fields get a special treat for tonight. 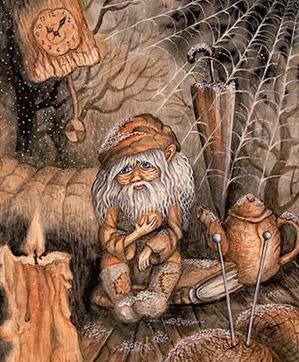 Many people say, that on this night they too are celebrating and one can see them dancing.